Really busy today, getting ready to leave tomorrow morning. 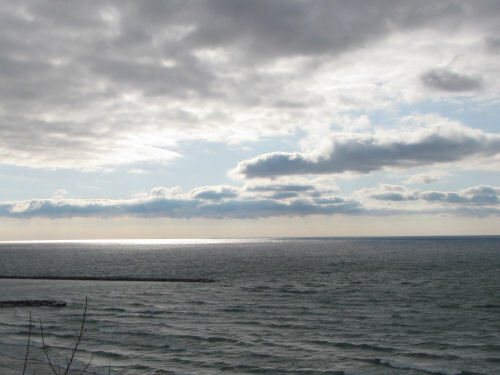 Here's the shining end to a gray overcast day (Monday), over Lake Michigan. In case I can't bring you a current entry Thursday, hop on over to Shark Bytes and Tales, and read my review of a book for young adults, by a friend, Jennifer Walker. If you comment, you'll be in a drawing for a short story, also by her. See you in the east! 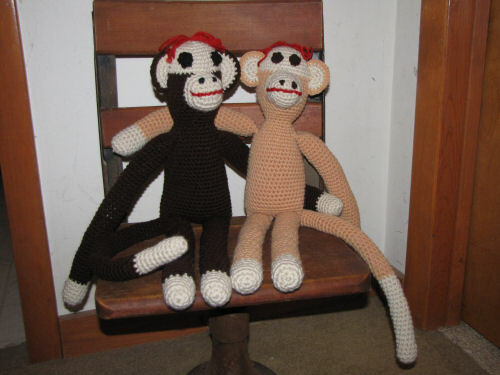 Both monkeys done! Just need to gift wrap them. Long-time readers may know what this means. Yes, it's the end of February, and I'm getting ready to head east to see my two favorite little girls, Anja and Mia, their parents David and Rachel, my best friend Marie (the grandma), and more. Of course the event that prompts the trip is the Philadelphia Flower Show. 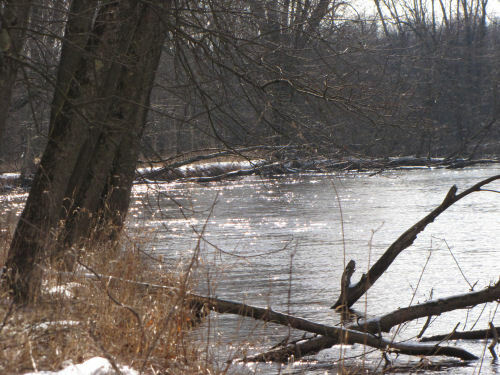 One of the great products of northern states is maple syrup. In addition to tons of time, it requires maple trees and the right kind of weather. 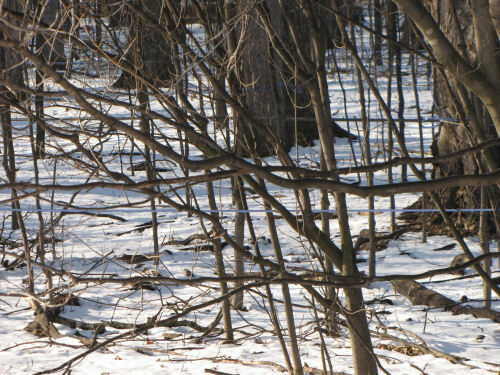 When the days are warm and nights below freezing the sap begins to move up the trees. It can be "tapped," collected, and boiled down into syrup or even farther, into maple sugar. The trees were traditionally tapped with a small piece of pipe on which a bucket was hung to collect the sap. In small commercial operations now, the buckets are replaced with plastic tubing that delivers the syrup to a central locations. 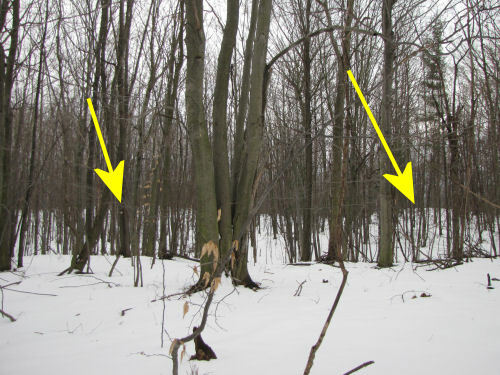 You can see the blue and black tubing strung between the trees. 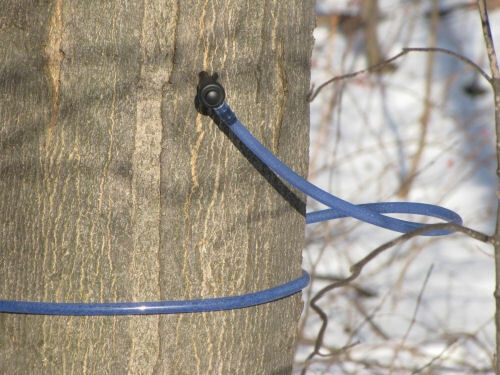 There are special ends on the tubing that can be pounded into the trees. Whether you are going to boil down just a little bit or gallons and gallons of sap, you should not do it inside your house. The steam is full of sugar and will make a real mess. 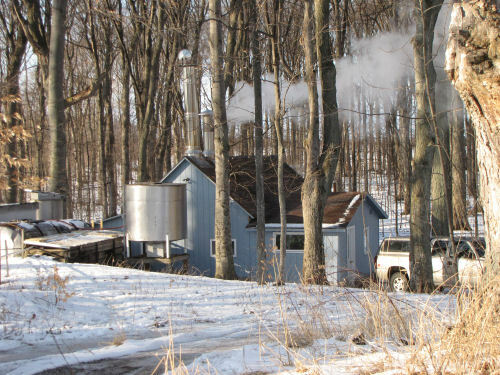 Small commercial operations (how most syrup is made) have a special sugaring house where the boiling is done. Here's where this sap was going. Of course, traditionally, the boiling was fueled by a wood fire. You can see that this place uses propane gas. Does all this progress take the romance out of that small jug of syrup you buy for $10 or more? Maybe. But it will still taste great. Think what it would cost if all that work was still done by hand. 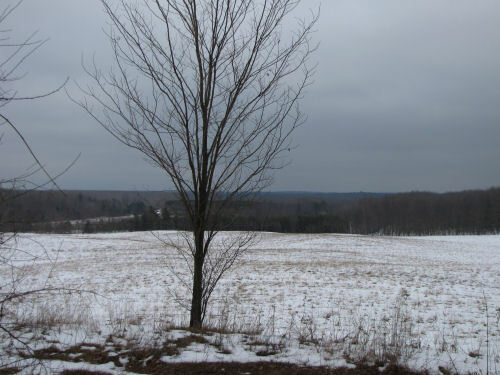 As for the weather, I would think this won't be a great year for syrup. It's been too warm in general for a good sap run. I love the name of this plant. It sounds like a candy, that forms magically wherever a tear falls from the beech tree. Once we leave the fantasy world, it's still true that they are found only under beech trees. But it has nothing to do with things dropping from the branches. 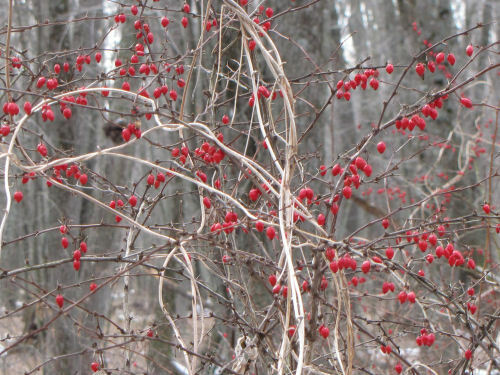 What happens is that the plant is parasitic and requires beech roots to grow from. I've come across several clumps of them in the past couple of weeks. I never thought of looking for them in the winter. They "bloom" in August or September. 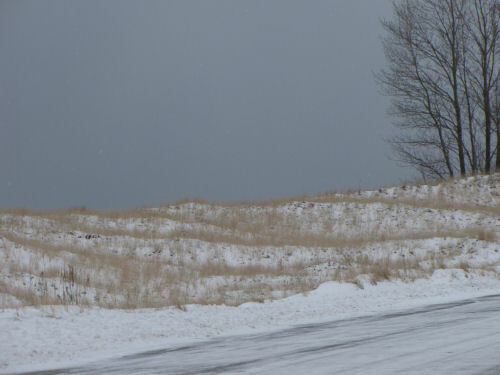 However, against the snow, you can really see the shape. 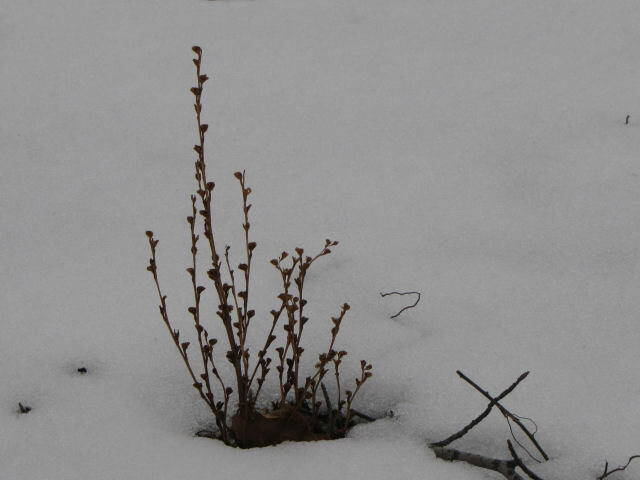 Beechdrops, Epifagus americana, have no leaves, and no chlorophyll. These look dark brown, but even when they are fresh, they are a pinkish brown. 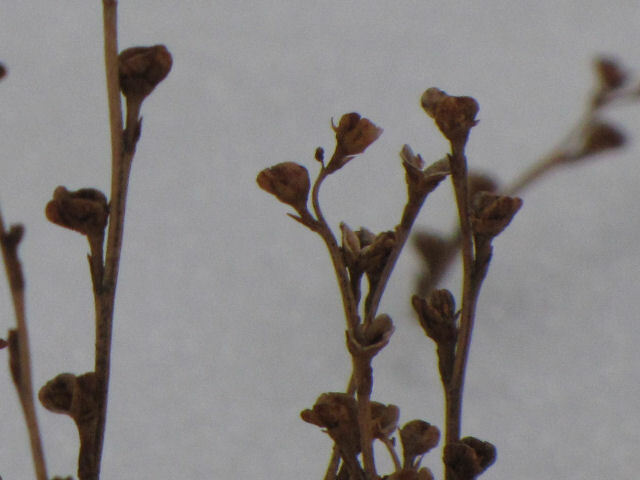 Here's a closeup of the flowers (dried, of course). Somewhere, I have pictures of some in the summer. If I ever come across them, or maybe see some fresh ones, you'll see it again! Just some interesting pictures today. I had to go out to the State Park in order to meet some campers. 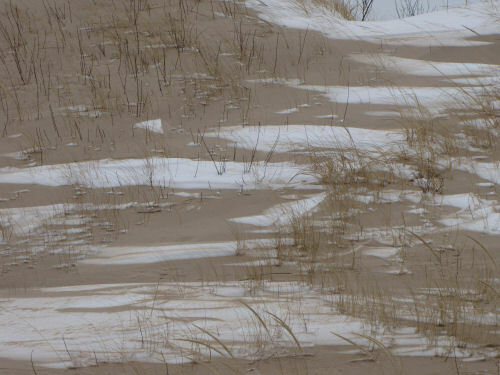 I love the way the sand and snow mix with the help of the wind, and form patterns. With the predicted snow for today I was kinda psyched about having a good day of skiing, even if it didn't last much more than the weekend. And I awoke to a white wonderland. So far so good! So, time for the morning outing. I put on the skis, and headed for my first little hill. By the time I pushed my way to the bottom (yes, you read that right), I knew I'd be walking back. Have you ever tried to walk on skis that have snowballs attached to the bottom? Have you ever tried to walk on can stilts with no ropes to hold on to, with long sticks between your feet and the cans? Have you filled the cans with cement? The snowballs grow with each step, too. Yes, those are SKI tracks. I should have made a snowman. Today was very springlike! And yet, we are supposed to get several inches of snow tonight. If we do, I can ski a bit, but I couldn't let the nice afternoon pass me by. So, I went to Gale's Pond, where Ellen took me for my birthday two years ago. By the time I got there, it wasn't sunny anymore, but it was still mild. There were a lot of geese and ducks on the lake. The geese were totally serene. 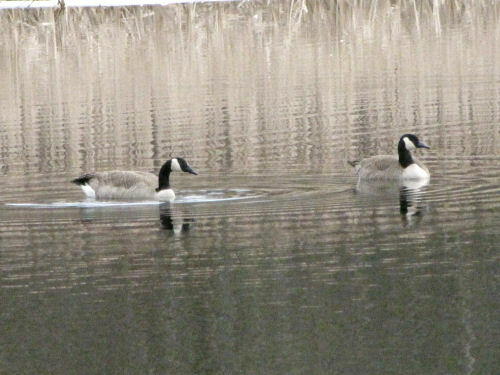 They swam a little to move farther away from me, but never flapped a wing. 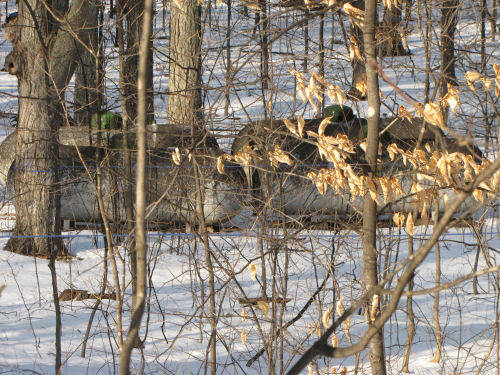 On the other hand, the ducks- all mallards, very common- were nervous as could be. 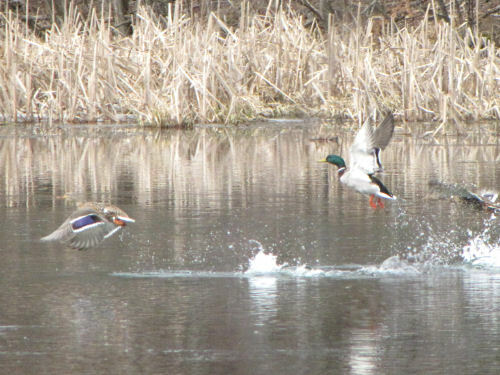 Every time I moved down the trail they would quack and quack and fly off to some other part of the pond. But, for me, the very best sighting of the day was someone a bit unexpected for February. The chipmunk does hibernate, but will occasionally wake up on mild days, so that must be what happened today. This is a cousin to the 13-Lined Ground Squirrel, but not the same animal. 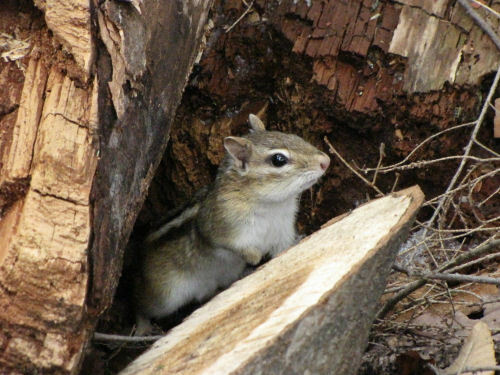 The Eastern chipmunk, Tamias striatus, likes to burrow under rock piles or jumbled logs, etc, while the 13-lined ground squirrel digs burrows out in the open like a prairie dog. I love the chipmunks! (But they always seem to look worried). I've been learning a new knitting technique called entrelac. You knit sections by increasing and decreasing and picking up stitches so it ends up looking like woven strips. It's simple but tedious. And this is the wrong yarn to show it off. It looks really nice in an ombre yarn where the sections of color are long enough to make the blocks mostly one color. I suspect I'll rip this out and save this yarn for something else. If you live in the northern United States, this is a very common bug, but I haven't talked about it before. It's commonly called a snow flea, but it's not a flea. It's not an insect either, but it is a cousin of the insects. It's an arthropod like shrimp, crabs, scorpions, centipedes, spiders, insects, etc. Arthropod just means "jointed foot." 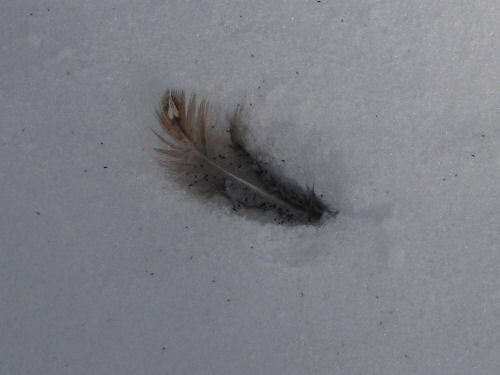 Did you notice in the pictures yesterday that there were black specks beside the feathers, on the snow? Those little guys are the snow fleas! Scientific name Hypogastrura nivicola. I've made a short Shark Show you may enjoy. I had chosen to wear hiking boots. They were adequate to keep from getting wet feet. They were probably the right choice, but the walking was a bit challenging. 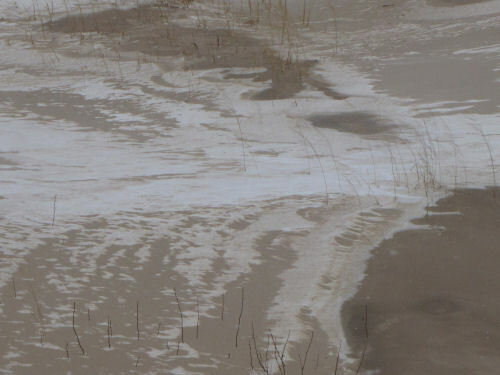 There were a couple of inches of soggy snow making the footing a lot like walking in loose sand. I had planned to hike for a couple of hours. But my calves were yelling in 15 minutes! Well, we walked for 70 minutes, and it was plenty for both Maggie and me. I guess it wasn't a great day for wildlife. I saw/heard three species: some grouse flew through the trees, a crow called from a distance, and... you'll have to wait for tomorrow for the other one. I'm making a video. 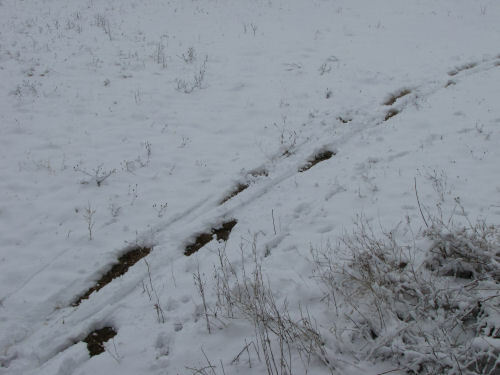 We did see a lot of tracks, but nothing new. I think the best story is the grouse that did not become someone's dinner. I'm guessing a fox, due to the large number of those tracks I saw. 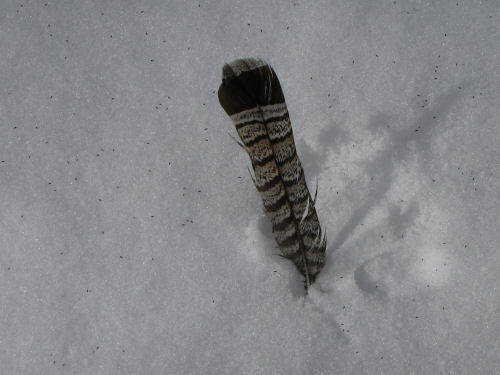 Said grouse lost a couple of tailfeathers. No problem... but it also lost a few body feathers. And, there were also a few breast feathers! But... that was all. No blood drops, no other feathers. There weren't any grouse tracks, so I'm thinking the bird was coming in for a landing, saw the fox and tried to lift off again, and the fox managed to grab a mouthful of feathers, but nothing else. I love stories in the snow! I think you'll like tomorrow's video... something new (as in not blogged about previously). This is not the regular daily post... just a side note. The new Blogger word verification is SO terrible I am choosing to remove it and see how bad the spam is. I'd rather do that than lose commenters or readers. I'm just a vitamin D junkie- when the sun shines I have to go out! I even got Om to go with me today by agreeing to a short walk. 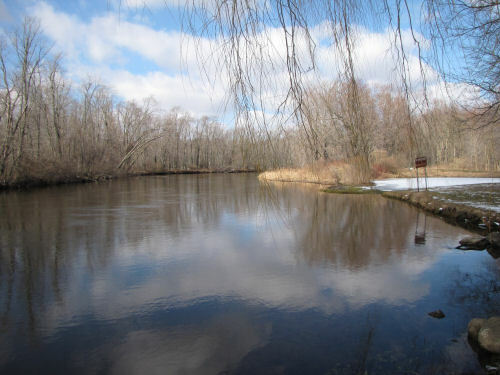 So I chose the loop at Scottville Riverside Park. The sun shining on a bend made everything all sparkly! When we finished the loop I looked back the other way, and had this nice view. I thought the bleached vines growing on the barberry made a pretty design. That's it... just a nice day. 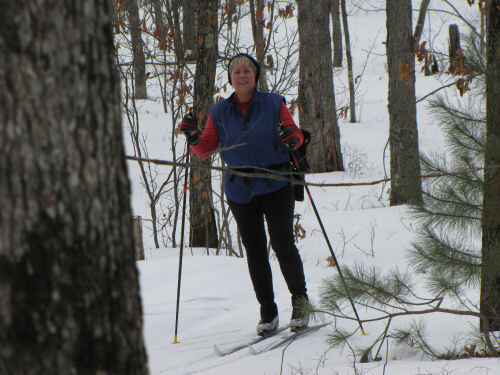 Today was the trail club outing at Big M. We had a small turnout, but we had a good time. 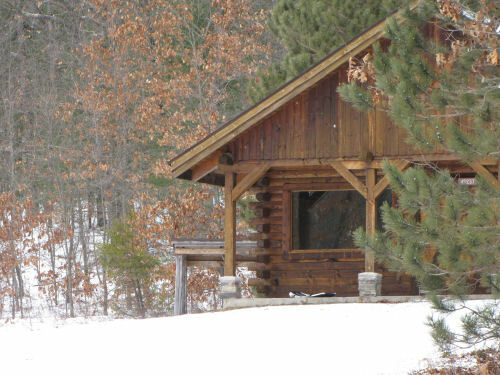 There is a large and beautiful warming shelter there, with a wood stove. A Boy Scout troop was there before us and the building was nicely warmed up. Thanks to a slim inch of snow last night that topped off the icy base, we were actually able to ski. Only Loren and I actually went out on the trails, though. It wasn't fantastic skiing, but in a winter where we count the times we've even been able to ski on our fingers, we'll take anything we can get! We talked a bit about how to attract more people to come out on our hikes/events. We used to regularly get quite a few, but that has certainly changed, and we don't really know why. There I was in the (really) tiny town of Harrietta, shooting a picture of the roof of a house, when a hawk soared over the house. I caught two shots, and they are both pretty good. I could see it was light colored, but couldn't tell what it was till I looked at the pictures on my computer. This is an immature red-tail hawk, before it develops the red tail. How do I know? 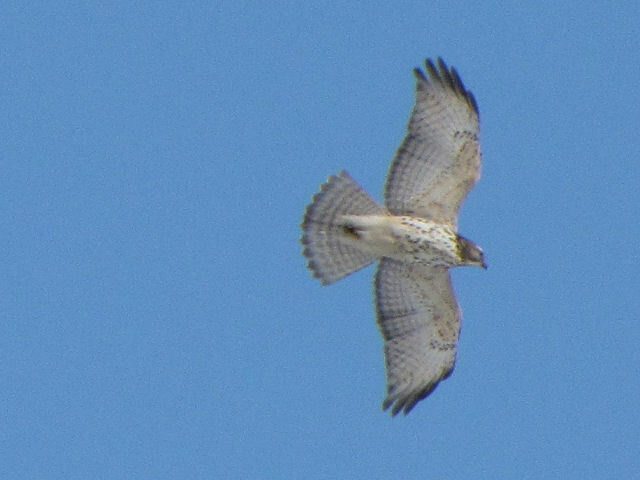 Overall, this is a stubby hawk with a short, broad tail. That makes it a Buteo hawk, which narrows the choices. The tail has a whole series of narrow bars. The breast is light and speckled. The only other choice in this range would be an osprey. But the osprey has longer wings that are bent back at the wrists more like a gull. The osprey also has distinctive dark patches on the wrist. 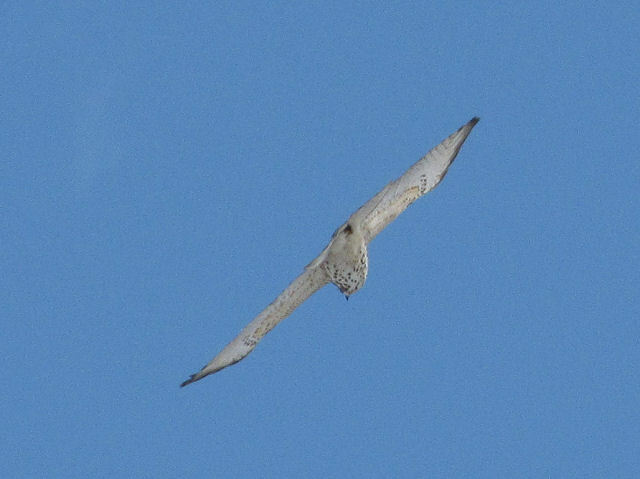 I wish I had pics this good of an adult red-tail! 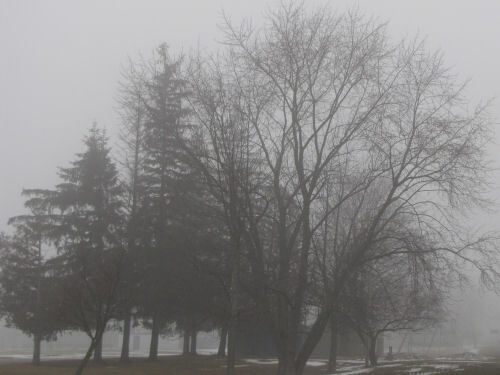 This picture was taken about 9:30 this morning, but the fog hung around until afternoon. It did move out and we had a bit of sun in the late afternoon. My car had a tune-up. The little Subaru doesn't need them very often, but when it's ready it lets me know with a consumptive little cough. Tomorrow is a work day. It's also predicted to be sunny, so I'm hoping to bring you some pretty pix from.... somewhere! Have I mentioned on this blog that I've started writing a weekly column for the Mason County Press? The proprietor is just getting it started, so for now, no money, but there is hope that will actually change. 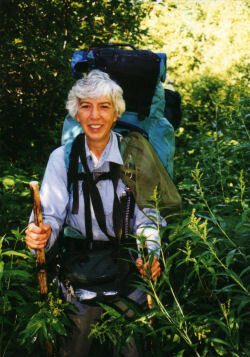 Of course it's about outdoor adventures. 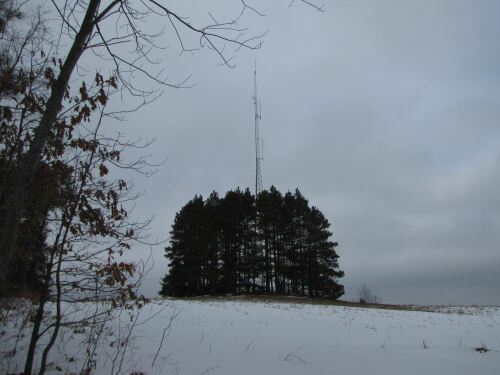 So, today, I went to find the high point of Oceana County which is just south of me. I'll be showing you different things from what I'll use for my column, which will run on Feb 23. All in all, as a means of getting exercise, the trip was a dud. Supposedly, there are four peaks of equal height (or so close that you should visit all four to be sure you got the highest). Here's the obvious one. That picture was taken just about where I parked, so you can see how difficult of a walk I had. Not. However, I was rewarded with a couple of decent views, except for the fact that the day was completely overcast. Here's what I could see to the east. The other three points are along a ridge just on the other side of the road. I got two of them in one picture. I've pointed them out with arrows, because they certainly don't stand out. But Maggie and I dutifully walked to the top of each of them. The only views were more trees, albeit a little lower down. I'm glad I've done it. I always wondered where the actual high point was. Oh, it's 1083 feet above sea level. I'm not sure I walked that many horizontal feet to visit all four points! There are few trees that say "north" as clearly as the white birch. It's such a beautiful tree with its snow-white bark. It often grows with dark green hemlocks for lovely contrast, or among maples where it shines against their fiery autumn colors. 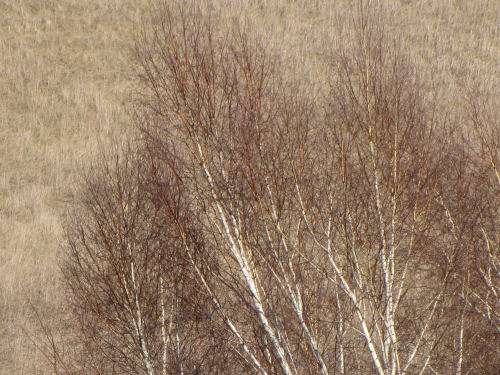 But did you know that white birch aren't always white? If you have a white birch tree in your yard, I'm sure you already know this. In winter it's especially easy to see this. 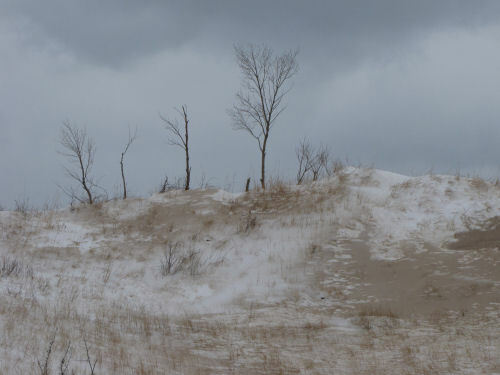 Young white birch trees, and the young branches don't make any pretense of being white. They are a dark, glossy purple-black. 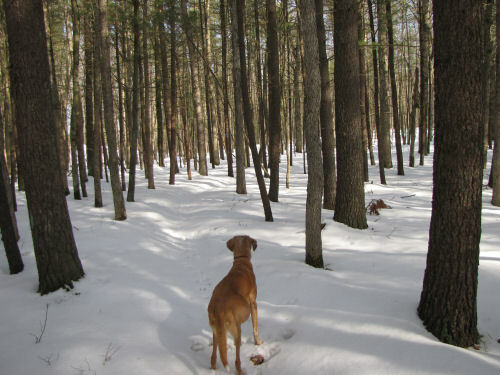 The white bark doesn't begin to show up until the branches are about an inch in diameter. Birch twigs, or the bark from dead logs (never pull bark off a live tree) is a wonderful firestarter. There is so much natural oil in it that you can light it when it's damp... almost when it's dripping wet. 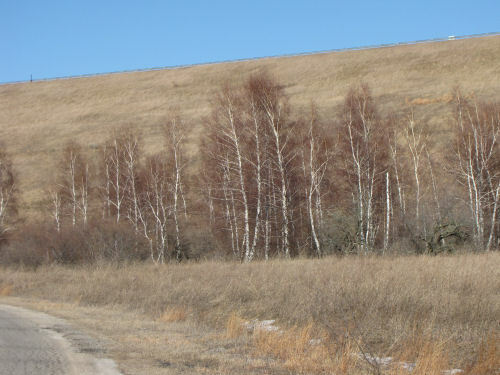 Anyway, when I saw this row of birch the other day, I thought it was good to illustrate the white birch.